The thought of any British citizen spending 15 days in clink for swearing seems to me unlikely; the thought of doing that and spending three extra years in prison for, in his version, peaceably protesting about the construction of a politician’s luxury home in a national park extraordinary. It happened to a man I know and admire, although it is entirely possible that he did not utter a single swear word. His misfortune may be that he is not British, but Russian. 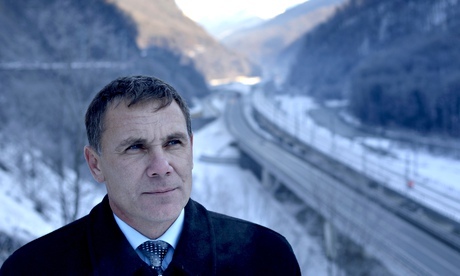 Evgeny Vitishko is a geologist and environmentalist living near Sochi, the city hosting the Winter Olympics and Para-Oympics. For our BBC Panorama, Putin’s Games, he stood in a freezing spot for well over an hour last December, as he patiently explained how it was wrong for the Russian government to build an entire Olympic city in a national park in the mountains. My ears perked up when he explained about his visit to Moonglade – in Russian Luna Polyana. He traipsed up to the mountains for two days, there being no road, to find a luxury dacha. As soon as he arrived, he was accosted by a military security team, dressed all in black. ‘What are you doing here?’ said security. The question why on earth is a member of Mr Putin’s Praetorian guard wasting his time up a mountain-side raises its head. Could it be, that far from being a research station, Moonglade is, in fact, a secret base for Mr Putin? The story goes that Putin’s builders used helicopters to transport concrete, steel, bricks, mortar and manpower up into the mountains – and that one helicopter crashed, killing everybody on board. None of this has been reported by the state media; none of this can be easily checked. The story continues that one of Putin’s trips to Moonglade ended in a snow-storm, when, because there was no road out, he was trapped. So the ukase came – build a road to Moonglade. Russia is a funny peculiar kind of democracy, if democracy it be, and you might have thought that environmental activists like Evgeny would have had no chance in pushing back against the President of Russia. But Moonglade is in a national park recognised by UNESCO as a world heritage site. As such, no roads should be built in the park – and if they are, then UNESCO might strip the park of its special status. And so no road has been built. Game, set and match to Evgeny and his chums from Environmental Watch on North Caucasus? Not quite. When Evgeny spoke to us, he was serving a suspended sentence for spray-painting a graffito on the fence of a dacha or villa the environmentalists say was also illegally constructed in the national park. The dacha belonged to the Putinist governor of the Krasnodar region. Evgeny denies doing any such thing. On the day before the Olympic torch relay was set to come through to Krasnodar – after I had interviewed him - Evgeny was arrested on suspicion of theft. This charge was dropped and a new one was brought against him, that he had been heard swearing at a bus-stop. Unusually, his case went to magistrate’s court that very same day. Evgeny asked to see his own lawyer but was refused by the judge who insisted that he used the state lawyer provided. Evgeny declined this offer. The judge also refused to call the two witnesses who had allegedly seen him swearing, and whose signatures were on the court documents. Evgeny got 15 days for swearing, but while serving that sentence, his spray-painting case suddenly came before the high court. However, because Evgeny was in prison for swearing, he could not defend himself in person. There was a video link but the technical quality was atrocious and he could not be heard for two-thirds of it, his friends say. The sentence for the graffito, which Evgeny denies, is three years in a penal colony. The danger for the IOC is they may start to look like a proxy for an authoritarian regime that frames its critics it cannot shut up. Meanwhile, Evgeny is on hunger strike. Join the conversation online! Follow John Sweeney.